Well, I wasn’t happy with the sleeves i made so I’ve ordered more yarn and put the project on hold until it arrives. Meantime, Randy is getting the new garden shed up and I am sorting and moving the contents. Some to stay and some to go. 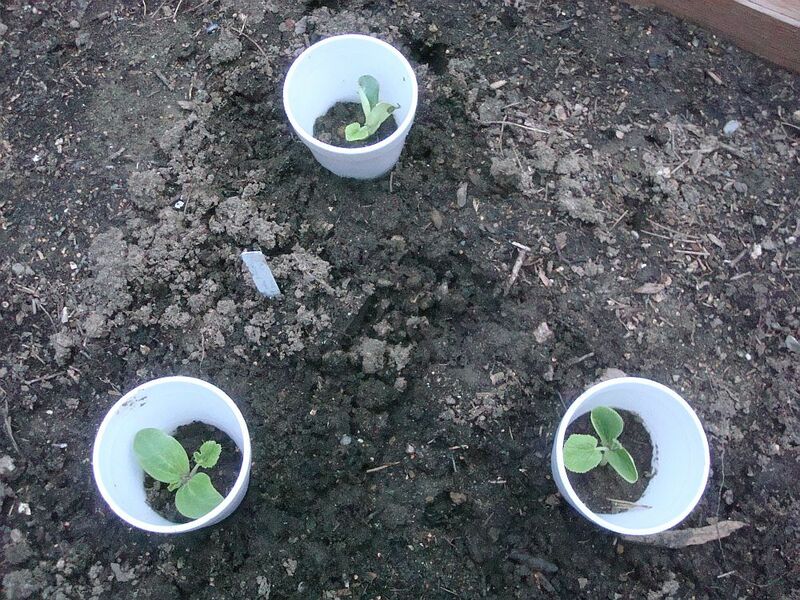 And since it’s gotten warm finally, I planted out the winter squashes and pumpkins. 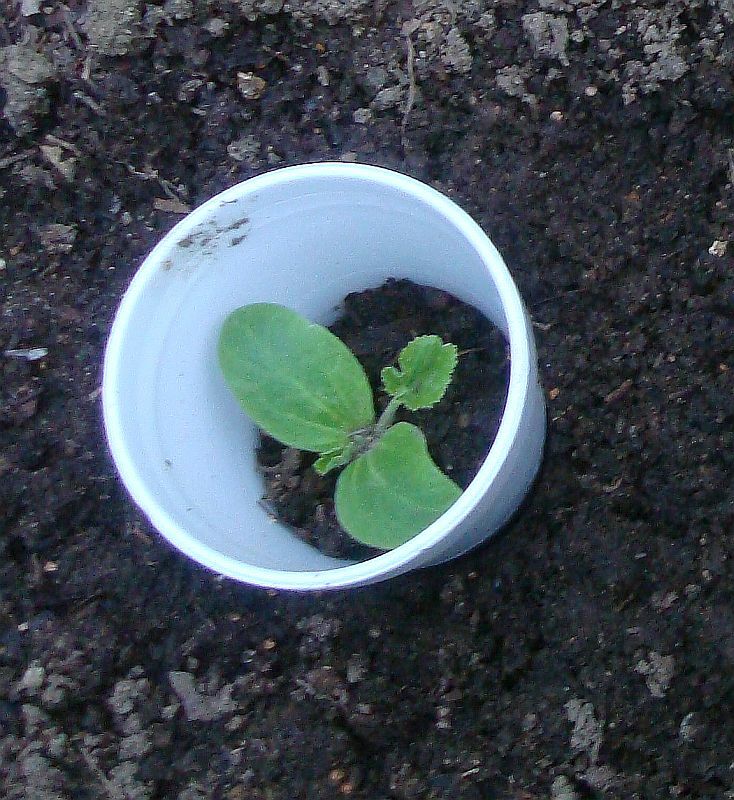 The peas are getting big, too! I wove some 7″ triangles and made a sleeve. I think it’s going to work. I need to weave the other one and sew up the neckline a bit, it’s too wide as is. Then we’ll see. Meantime I was playing with a little thing I found on a Brazilian Youtube. 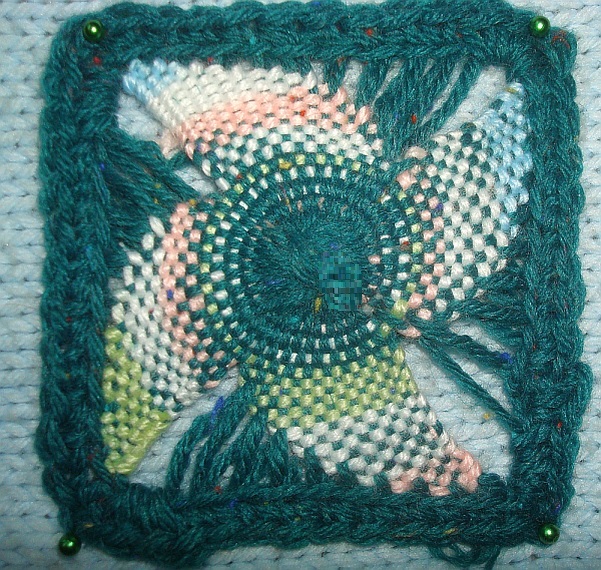 I did this experiment on the Tiny Weaver Square. It should have had 5 petals, but I wasn’t up to the math and just wanted to see how it would work. Kinda of cute. Takes a bit of time and my warp was, in this case, too thick to really work well. There’s a rather too thick lump in the center where all the warps cross, but I can see uses for this sort of thing. Got the top pinned together and am sewing up the shoulders and sides. Fit is pretty good, near as I can tell but… same ole same ole… It needs sleeves. No, I need sleeves. I think this would be cute as a sleeveless top on someone with firm young arms. Mine need sleeves. Not sure how I’m going to go about that but will be working on it. Here it is so far. 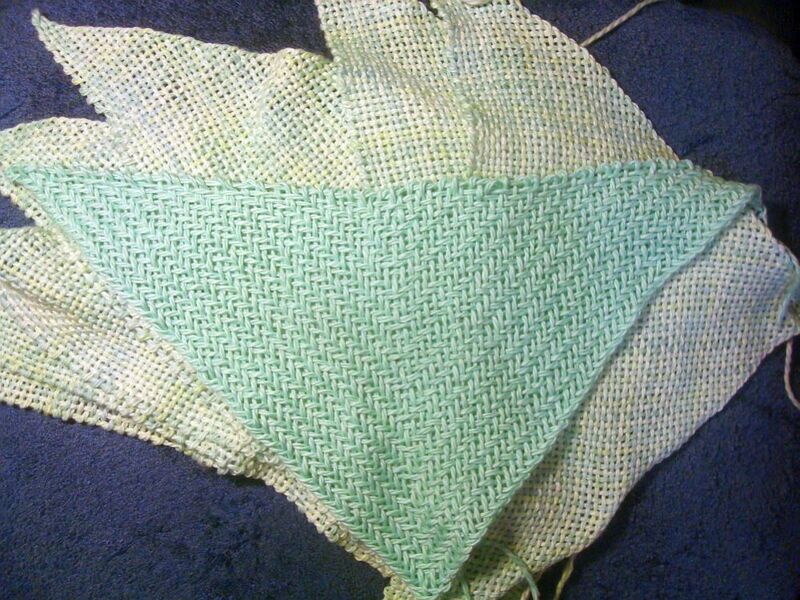 The front I assembled using a slip stitch in the darker yarn. 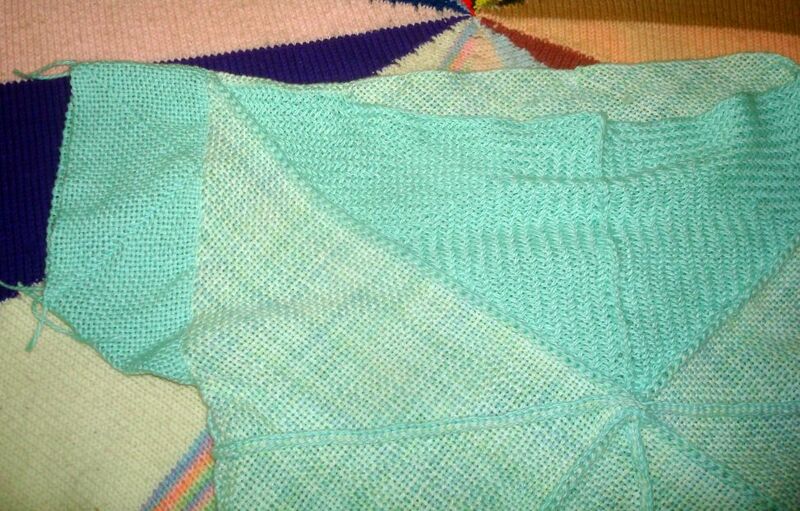 The back is just an overhand stitch in the same yarn. I decided that if I was going to be wearing a target, it should be on the front and not the center of my back! More later! A hail of a spring day! Hail, rain, wind and all the while the sun shinning! lol Well, not all the while. It did gloom up now and then, too. And never did get very warm. Took my morning walk and then came back in and went back to weaving. Lookee there… it’s hailing again! I always feel sorry for the poor critters out there in that stuff. I remember many, many years ago walking home from school and got caught in a hail storm. Tried hiding under a hedge but finally ran to the nearest house and begged asylum. The lady let me come in until the storm passed. That was actually 60+ years ago and I remember it vividly! I hope all the critters can find a safe place to ride out these showers! But back to weaving, the suns out again! 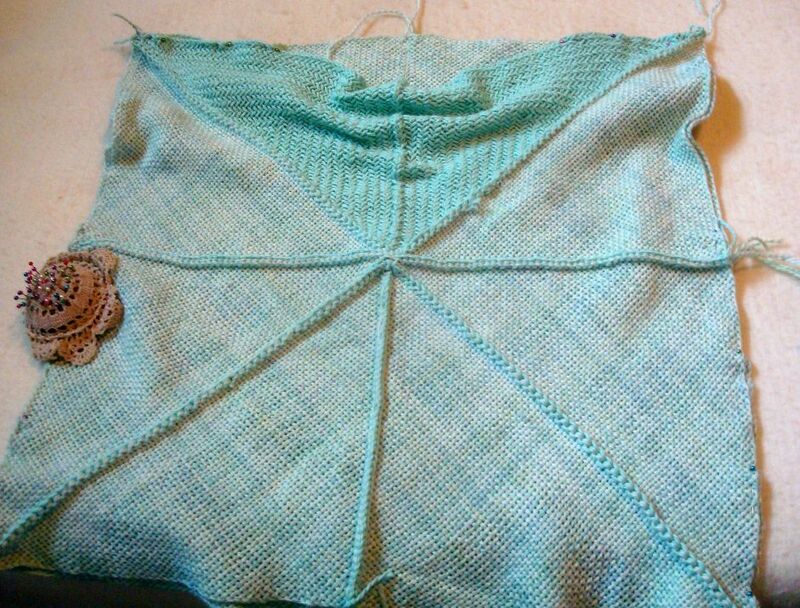 lol I decided to make the center front yoke in the second color and weave it in a twill. I think it’s going to work. 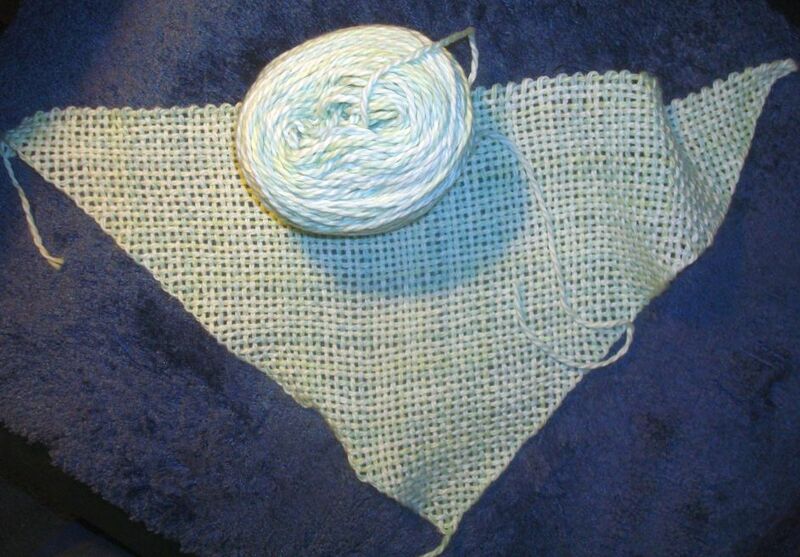 The white 6″ cotton squares are going to take a long time, if they ever do get done. The one I washed did soften up. Not a lot, it’ll still be a ‘crisp’ cotton, but mostly it’s going to take a long time to weave them. So meantime I have a new project started. Have some worsted weight cotton in my stash. It’s make by blue sky Alpaca, but it’s 100% cotton and very soft. I’m not sure how it will wear but decided to try it. I’m using the 14″ triangle for this one. I just finished weaving the first Tri. 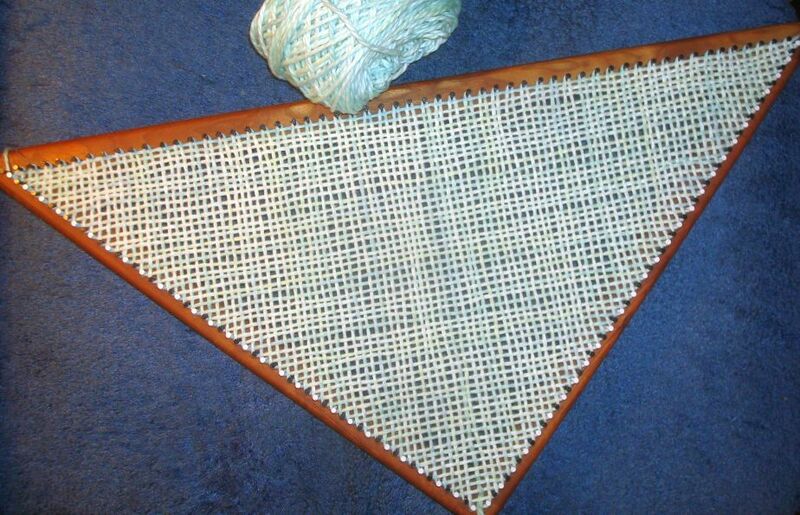 It took 30 minutes to weave this one, it’s woven plain. 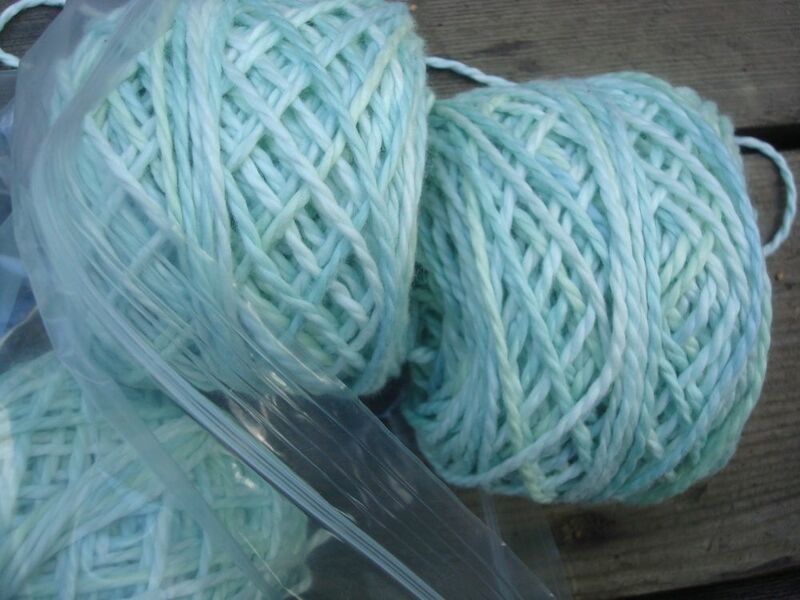 The yarn has a subtle variation with very light blue, a slightly darker blue, and just a tiny touch of a light green. It doesn’t photograph well. I might work a texture for the yoke tris. Haven’t decided about that yet. 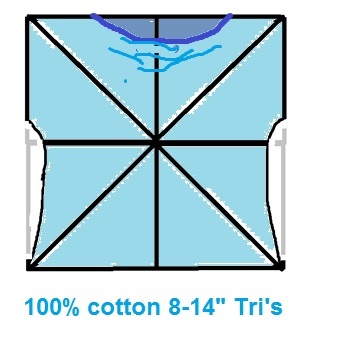 But here’s the sketch of what I have in mind and the fist tri. No weaving going on this weekend. My hands are now too grubby to touch yarn! Gardening and spring type yard work instead. 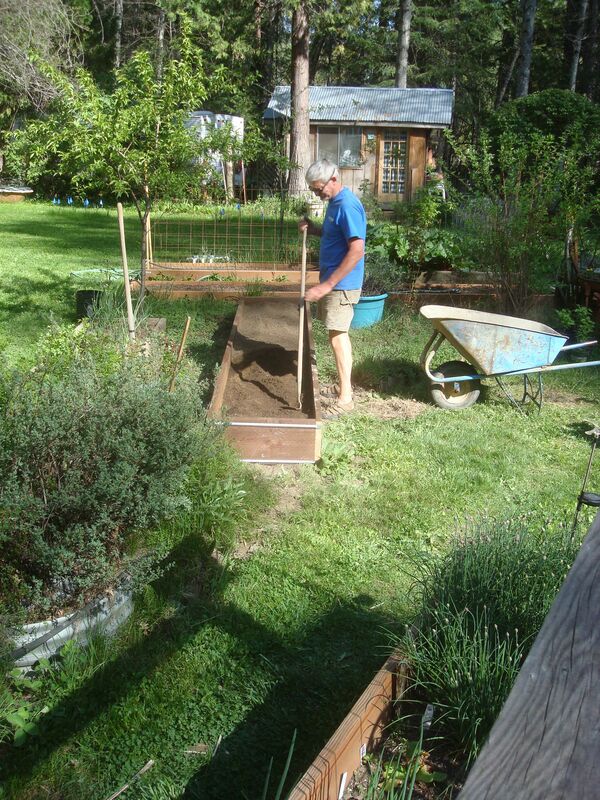 For instance, here’s Randy filling the new garden box with compost and dirt. He sifts all the rock and roots out first, lots of work but it makes a nice growing bed. 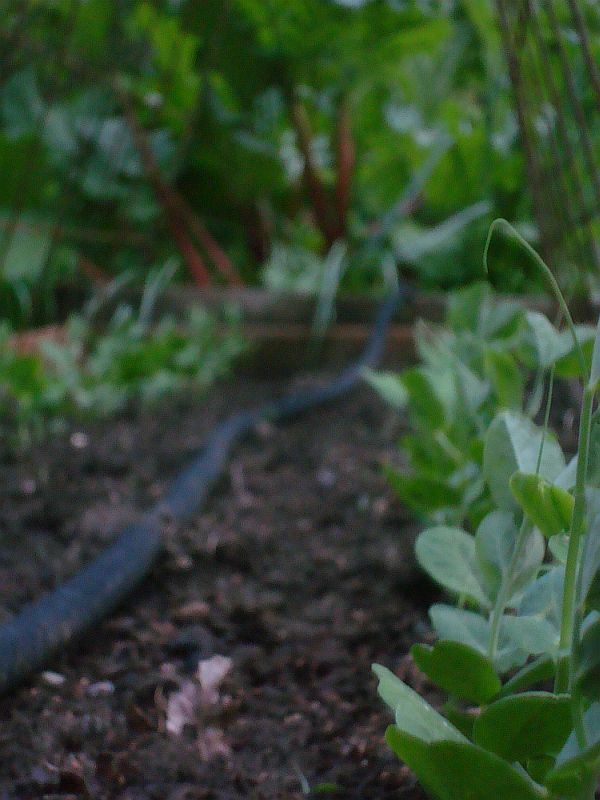 The tomatoes will go here this year. 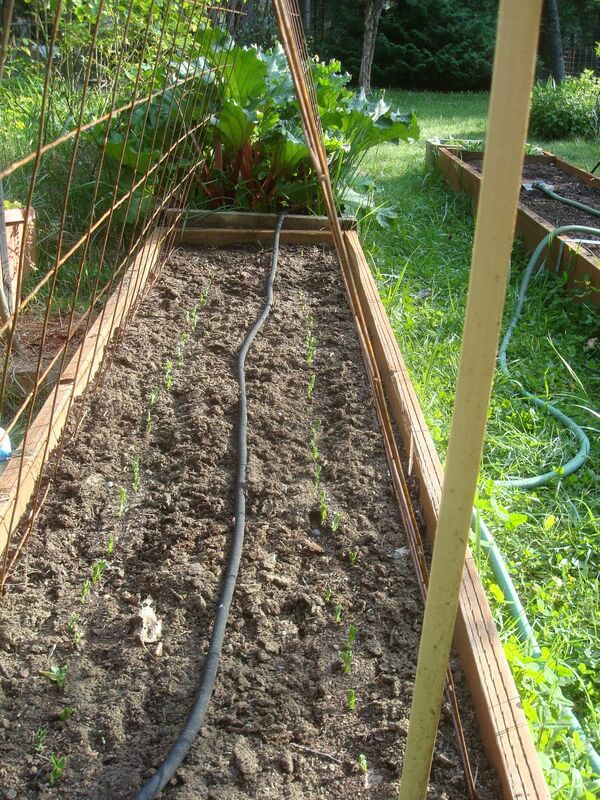 He also put up the pea trellis, tho they haven’t quite reached that high yet. 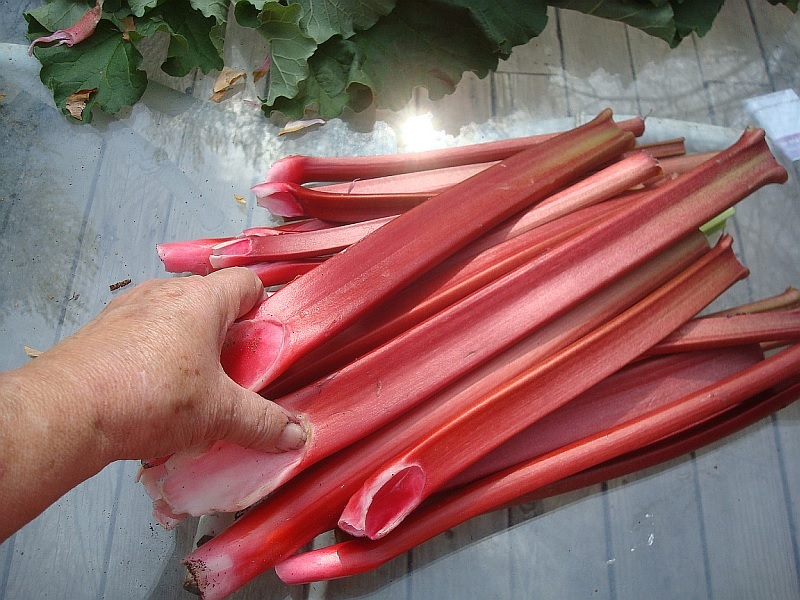 😉 A bumper crop of rhubarb in the back there. The bed to the right will have summer squashes and cukes eventually, they’re still in the baby seed bed, but growing nicely, as are the onions in the left photo. I planted three kinds this year, the regular yellow, also some white and red which I haven’t tried before. 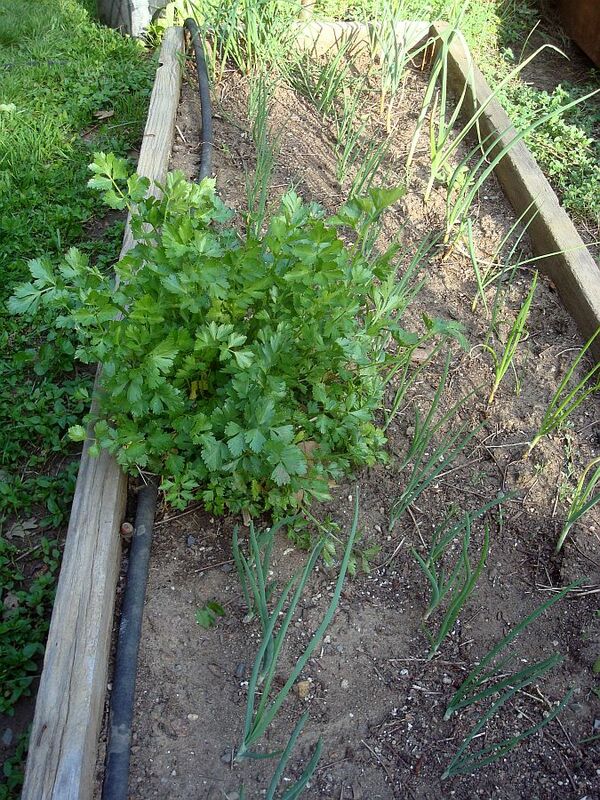 The bushy plant is a perennial celery. Kind of a cross between celery and parsley, I guess. It has the celery leaf flavor, and that’s what I like. It’s in its third year now. 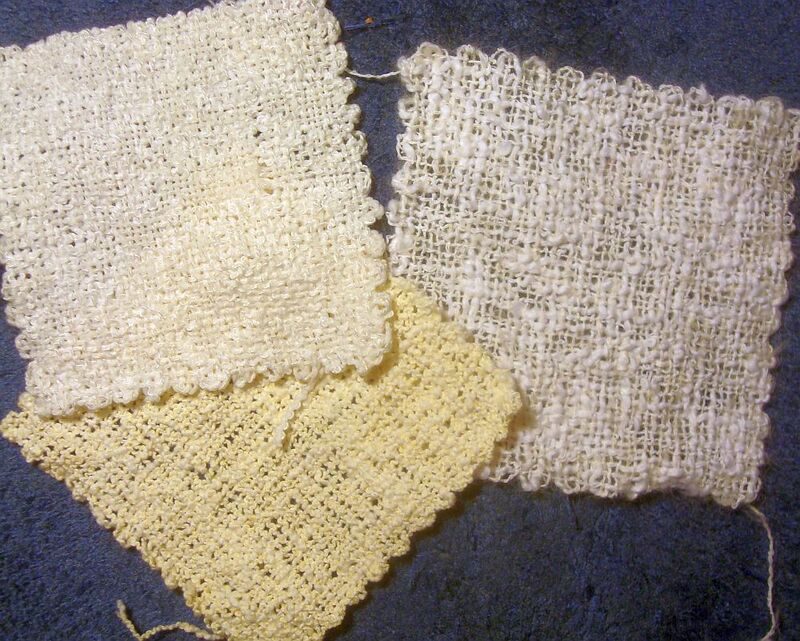 But I will show you the squares I wove last week from the stash picks. I am leaning heavily to the one on the right. It’s the easiest to weave and I rather like it’s texture. I think it’ll make a nice summer top. But it won’t be a fast one because even being easiest, it is still a slow yarn slow work with. I don’t seem to have the labels handy but if I haven’t said what it is, I will when I get back to it. Meantime, I am enjoying a nice summer this spring. Hope it’s a warm sunny weekend where you are! 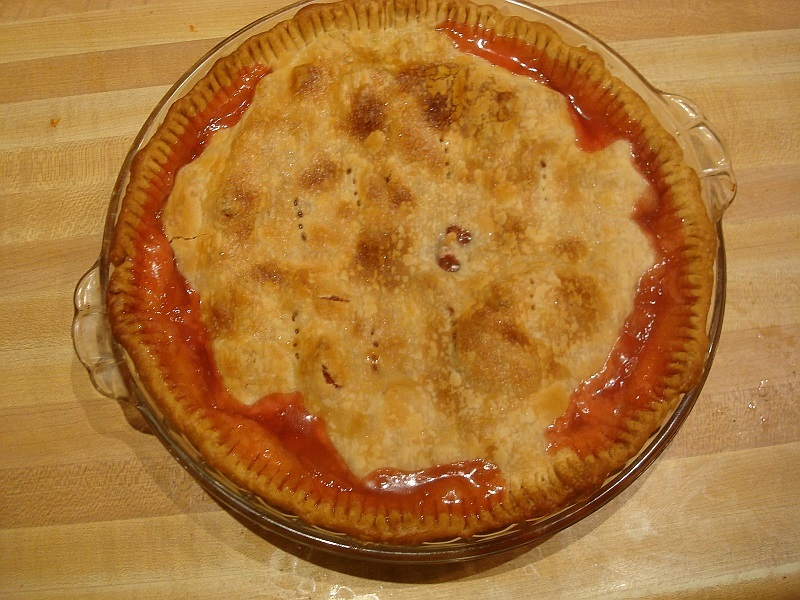 Guess what we’re having for dessert tonight! Yummm!!! !